I spent a few extra hours in the office trying to reverse engineer this, and so I did. I think it’s crucial to understand their competitiveness formula so that you can also understand what they take into consideration the most, why it’s flawed and what you can actually use it for. Other tools’ competitiveness formulas are often similar, but nevertheless neither will be perfect. 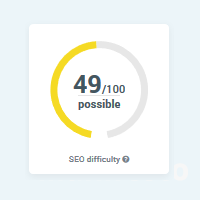 KWFinder calculates SEO Difficulty by getting the Rank (using their competitiveness formula) for each page, then calculating the average of the top 10 SERP results. When we test the above formula in Excel, the numbers pretty much add up. This is as close as I could get to the original formula, but as you can see, results in column G are almost the same as column F, with a few exceptions. 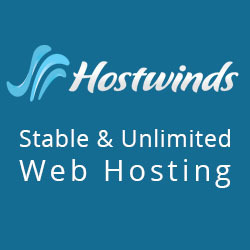 These doesn’t mean much when we calculate the total average – I was just one point off KWFinder’s score of 68. This means a few things. First of all, these are all Moz metrics. 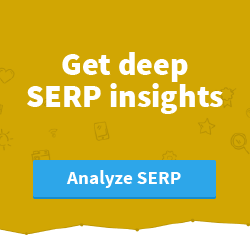 This means that KWFinder relies solely on Moz data in order to calculate keyword difficulty. Then, they give the most value to Page Authority – which I essentially agree with. However, that doesn’t mean that PA is a perfect metric. 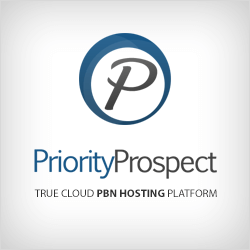 We all know that you can block the SEOMoz crawler if you’re using PBNs. 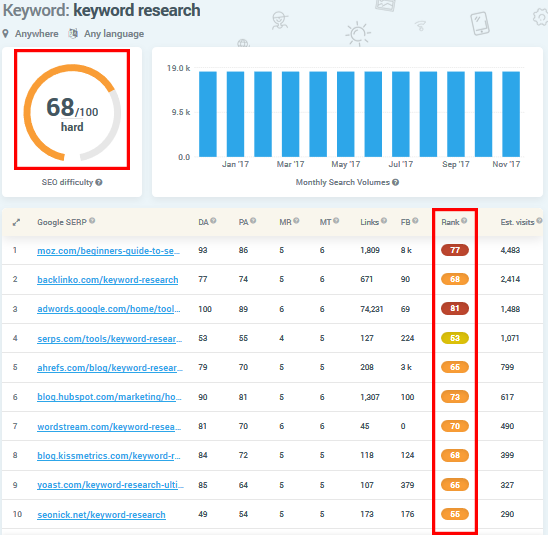 This would mean that a certain result could actually have tons of links, yet Moz may not see any of them – the KWFInder Rank for this result will be very low, thus lowering the average competitiveness score of the keyword. This is what I call a false positive low competition keyword (more about this later). Get enough affiliate websites with hidden links on page 1, and you could get a KWFinder SEO score lower than 20 even, telling you to “Go For It” while in reality you could only go F yourself. Also, giving Domain Authority a value of 25% without additional conditions can mess things up quite a bit. Let’s say you had a super easy keyword, with nothing 10 YouTube videos on page 1, each having between 10 and 1000 views, nothing else. No links, nothing. According to KWFinder, this keyword would have a competitiveness score of 25, while in reality it should be 0. The keyword will have this score because YouTube.com has a DA of 100 – put that at 25% and each results will have a KWFinder Rank of 25. Another thing about this formula is that it doesn’t seem to take on-page into consideration at all. I’m not even gonna discuss MozRank and MozTrust, and I don’t know how or why they combined these two to give them 25% of the value in their formula – not quite sure how and why you would assign these weights to both of these metrics. Hope that helps shed some light on how KWFinder calculates competitiveness and why these calculations (for every keyword tool out there) are to be taken with a grain of salt. Wow detailed research you just cracked the code.. Well done. 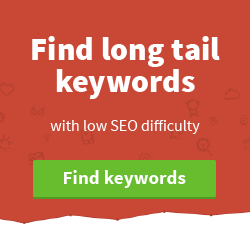 BTW can you point to some tutorial showing how to check keyword difficulty manually. What a great share! Most people who review these services or even “teach” keyword research never even touch on how it’s actually calculated so this is pretty impressive. Amazing find Aleks. 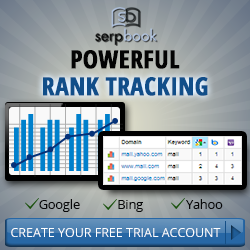 I never trust 3rd party metrics, as I know first hand how easy it is to manipulate Moz DA and PA. This post just proves that nothing can beat manually analysing the SERPs and using common sense. Great share! Hi, your Search function seems to be broken, I put Manifesto into the Search box and it came up with nothing. I had to use google, site:nichegains.com “Manifesto”, to find that post. Thanks for the feedback. The search function is fine, it’s only because I actually changed the title of the original post I assume, and it no longer has the word “manifesto” in it. That is the URL of the post, which was its original title. I’ve since updated the title of the post and it can be found when searching for the new title.